On April 15, the Mission Committee will be collecting envelopes sent to church members for One Great Hour of Sharing , which supports Church World Service. Since 1949, Presbyterians have joined with millions of other Christians through One Great Hour of Sharing to share God’s love with people experiencing need. Our gifts support ministries of disaster response, refugee assistance and resettlement, and community development that help people find safe refuge, start new lives and work together to strengthen their families and communities. Recognizing that the hope we have in Christ is lived out in our hope for one another, we respond with gifts that help our sisters and brothers around the world find the hope for a brighter future. 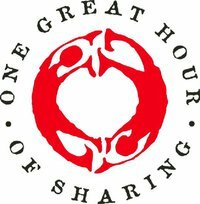 Contributions to One Great Hour of Sharing make a difference in the lives of people. Church World Service, a division of the National Council of Churches, with overseas partner churches and church councils are often the first on the scene following a disaster of natural or human origin. Local church leaders identify the needs of their people. Priorities are set to bring long-­term solutions that will improve the quality of life for individuals and communities around the world. One Great Hour of Sharing, nearly 50 years old, continues to respond to needs equally critical as when it was first created.